As we first reported earlier this week, the Sooners will host 5-star running back, Chris Tyree out of Thomas Dale High School (Chester, VA), this upcoming weekend. Ahead of his visit, I spoke with Tyree’s father, Richard, to get to know a little bit more about Chris, his football background and his interest in the Sooners, among other schools. One of the first things I want to know about a player is whether they love what they do. Tyree has the genetics of an elite athlete. His father was a multiple sport high school athlete and his uncle’s from his mother’s side were the same. In fact his paternal grandfather was from Texas and his mother’s family was from Florida. So, the DNA of two elite football states runs through Chris. But again, I like to know if a young man loves the sport. Chris does. “Chris started playing football at a young age”, Richard noted. “In fact, he begged me to play football. He was seeing the kids playing at the park and wanted to play maybe starting around three or four years old. So by the time he was five years old we signed him up for football”. As Chris got older, he began playing on travel teams and the family started to realize that Chris’ elite skill set, including his blazing speed, might be bigger than just his local community. ”We didn’t really expect all this to happen but as we saw him playing out of state, he was still faster than everyone else on the field”, Richard said. In fact, Chris picked up his first offer between 8th and 9th grade. He had yet to play a down of varsity football but the family had the good fortune of having a high school coach who could see Chris’ talent early and was willing to tell people about. In talking about Chris’ first offer and the help they received from head coach Kevin Tucker, Richard said, “Marshall was the first school to offer him…his high school coach knew he’d be playing varsity and so he would tell coaches about Chris. He did something for my son that maybe most coaches wouldn’t do until a kid gets to that school. We are definitely blessed that we have a high school coach that pushes all his kids to get scholarships”. Coach Tucker was right. It wasn’t too long before Chris made a huge impact at the high school level and was pulling in offers. The first power five offer came from his in-state school, Virginia Tech. On film, Chris shows off his versatility and game-changing speed which is backed up by his track times. Last year as a sophomore he was running a sub 10.7 100! Off the field, Tyree is a star student in the classroom already. All you need to know is that he’s being recruited by Stanford. Academics are an emphasis in the Tyree household. “Academics are big,” Richard says. “I tell my kids, you’re going to college regardless, even if you aren’t on an athletic scholarship you should get an academic scholarship”. When you Tyree’s athleticism, versatility, academic work, football IQ and love for the game together…you get a near can’t miss prospect. Shane Beamer has really led the charge for OU when it comes to the recruitment of Tyree. Richard tells me that their first contact with OU was through Beamer. ”He had always been recruiting Chris even when he was Georgia. So, when he got there (OU), he showed the staff his (Chris) film and they kept an eye on him. Then, around, I want to say, November, Shane came and visited and they offered. We talked to the whole staff. They passed the phone around and they said they love what they see and felt like there is a whole lot they can do with him”. Although coach Boulware is in communication with Chris, it seems Beamer continues to take lead in this recruitment, “When Beamer comes to Virginia, anytime he’s in Virginia he comes to see Chris. Chris talks to Boulware every now and then but coach Beamer is still the main recruiter right now”. As the time ticks on the 2020 class, the family is trying to narrow down what official visits they will be taking. To do that, Richard has made it a point to ensure that Chris is able to take unofficial visits to schools that his son is interested in. Schools they’ve already taken unofficial visits to are Stanford, Notre Dame, Michigan, Mississippi State, Georgia. They’ve been to Penn State, Virginia, Virginia Tech and Florida State on multiple occasions. But they’ve got high hopes for this first visit to Oklahoma. In middle school, Chris played against guys from California like OU commit, Darrion Green-Warren, and the family is familiar with former Sooners LB and Virginia native, Ricky DeBerry. Richard says that when he reads about players like Green-Warren and DeBerry, they all say the same thing about Oklahoma, “once you get there you fall in love with it”. The family had hoped to be able to make a commitment to a school before the start of Chris’ senior season. 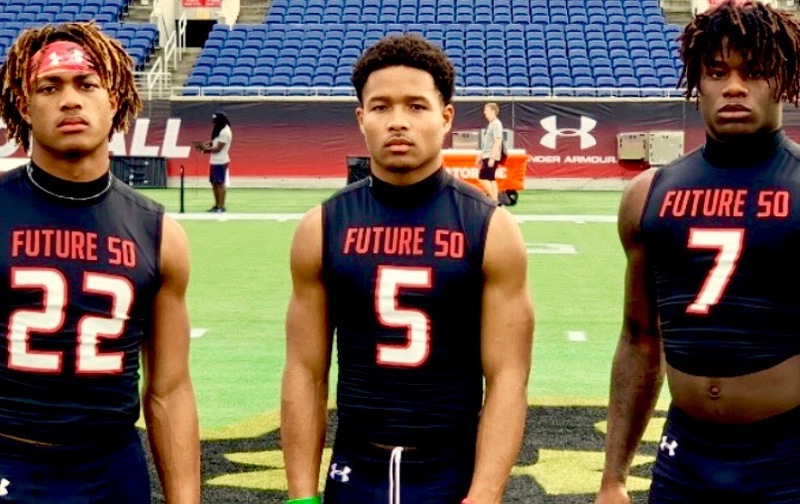 But, because they’re only permitted to take one official visit in the spring, Richard tells me they will likely try to fit a few official visits in during the first part of the season and then make a commitment, “probably by the end of September or beginning of October”. But it’ll be clear who the front runners are based on who gets official visits. ”We want to see the school first and then decide which official visits to take”. Among the schools that could get official visits are, Oklahoma (assuming the visit goes well), Notre Dame, Michigan, Penn State, and Florida State. After the OU unofficial, they have plans to take one more official, likely to Alabama. On speaking about priorities and what they’re looking for in a program, Richard said the following. It’s clear that the atmosphere at Oklahoma this weekend is going to be something that plays a big role in how far up the list Oklahoma can shoot. Lincoln Riley and Shane Beamer have done the work to entice the family. In fact, speaking on Lincoln Riley, Richard noted that his son said, “That’s one of the coolest head coaches I’ve met so far”. It sounds like Oklahoma’s tradition of running back development and tradition could help the Sooners as well. “His dream was always to play in front of a huge crowd. As a parent, I’m all for it. There are schools around here that are great schools but you might go to a game and half the stadium will be empty. At the same time, it has to fit. There’s no sense in going to a big school and not playing. It has to make sense. No matter where you go you can get a degree and that’s what it really boils down to is to taking advantage of the opportunity”. I don’t think OU will have much trouble making their case for a tradition of filling the stadium and putting running backs in the NFL. We should know more on where things stand with Chris Tyree and the Sooners in the coming days. The Sooners will host a handful of important visitors for unofficial visits this weekend. Super K has already gone in-depth on Chris Tyree and we will have additional information on all three following the visits. …now to be honest with you, K has seen Finnegan in person while out watching Dorbah in a Highland Park game and was very impressed. 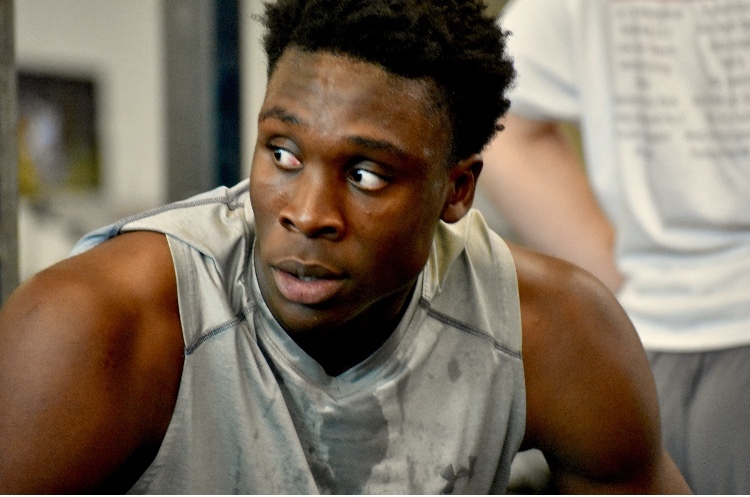 We both have been watching Finnegans film and we were kind of just scratching our head on how this kid doesn’t have a bunch of offers at the G5 level at the very least. The guy can go and he is a very intelligent route runner (adjusts to spacing very well). While we were going over the film, one of the ways we described him was like it was watching a cartoon character. He is very fluid and moves really well in space. Right now, these are the only visitors we have confirmed, but it’s actually a really good list of 2020 kids who all hold offers plus the 2019 PWO Finnegan. There is constant contact with the Oklahoma staff and Michael Henderson, the quarterback for Carrollton Ranchview. While Henderson is currently at the quarterback position, he said the Oklahoma staff is recruiting him as an athlete, with the idea to find ways to get him the ball any way they can. Henderson is listed at 6’2″ and 220 pounds which is one hell of a frame for a ball carrier coming out of high school. Henderson said he will visit Austin this weekend, and that his interest in the Sooners and Longhorns is “neck and neck” so far in his recruitment. I watched Payne back in November during Mesquite Horn’s victory over Temple in the first round of the state playoffs and caught up regarding his current recruiting process. The 6’5″ WR said recruitment has been rather slow with him focusing on the basketball season at the moment, but I fully expect that to change once his offseason comes rolling around. Payne said he is hearing a lot from TCU, UTEP and North Texas, however, is receiving the most mail from the Sooners. Though it is not a whole lot right now, this is certainly a name to store away for his senior season. I fully expect Payne to begin reeling in some big-time offers and his interest in Oklahoma would be very high if an offer came his way. Visited a few schools here in Arizona this week. I stopped by Higley to see 2020 4-star DE/OLB, Jason Harris. At Higley HS (AZ) to see two-sport 2020 star DE/OLB, Jason Harris. Lincoln Riley, coach Grinch, and coach Manning have all been by the school. Jason’s father, Sean, tells me that they knew coach Manning from UCLA and it sounds like Manning is taking on a big role in this recruitment. While Jason is a high level two-sport guy, my hunch is he’s going to ultimately play football. His father was a third round NFL draft pick out of Arizona. I get the sense that Jason may end up out of state at one of the bigger football schools. You may recall that I was very high on Jason’s older brother, Jalen, as a pass rusher. The Sooners recruited Jalen a bit but ultimately never offered. He is now the starting OLB at Arizona. Interestingly, Jason only has two unofficial visits set up for this winter/spring. The first will be to Texas in mid February. The second, as I mentioned above, will be for the OU spring game. I could certainly see this one being a Red River battle. With OU and Texas having their spring games on the same day, he can only attend one and they’ll be in Norman for the whole weekend. Harris is a priority target for the Sooners. If you would like to read Super K’s sourced team note, please click the Donor Board link! ***2020 LB, Antonio Doyle Jr. (St. Louis, MO) tells me that coach Odom was just in the building at his school which happens to be Lutheran North, where Ronnie Perkins played. Doyle was being recruited by Odom while Odom was at Missouri. Doyle says he didn’t even realize Odom had left for Oklahoma. Came as a bit of a surprise. Keep an eye out for a possible offer here. ***Also, 2020 LB, Mohamed Kaba (Clinton, NC) told me that the Sooners were expected to stop by and see him, as well. Again, we mentioned to not be surprised if an offer is made. Shortly after having ILB Coach Brian Odom stop by yesterday, Kaba was offered by the Sooners. Oh and btw, if the past few years hadn’t tipped you off that OU is recruiting nationally, you sure as heck can’t miss it in this cycle. The Sooners are everywhere. They aren’t looking for what’s close. They’re looking for the best. If you’ll recall, back on January 17th I said the following regarding the Sooners and 2019 4-star OT, Enokk Vimahi. Call me crazy, but I think the Sooners moved ahead of USC for 2019 OT Enokk Vimahi. At least, that’s the vibe I’m getting from people around Vimahi. At the time, folks still had Vimahi pegged to go to USC. But in speaking with folks close to Vimahi including his coach and others, it was clear that the Sooners really blew Enokk’s mother away with the visit. Since then, Enokk has taken a visit to Ohio State. Oklahoma leads but in the end are USC’s advantages too much for them to say no to when it comes to signing the papers? But what I wanted to pass along to you was something his Enokk’s father mentioned to me earlier today. I asked Vimahi if the Sooners had visited Enokk yet or if they plan on visiting soon. His response caught my attention, “not yet. I’m not sure if they (OU) will (visit) but Notre Dame stopped by yesterday and USC and Ohio State will stop by tomorrow”. I asked Vimahis’ father if the Sooners have stayed in contact and he answered in the affirmative. So, I’m not sure why, at this point, the Sooners haven’t visited. Perhaps they are that confident. Perhaps they’re going to come out this weekend. I’ll continue to monitor this. 2020 DB, Jacobe Covington out of Saguaro HS (AZ) has a prototypical NFL CB build. HC Coach Mohns loves his versatility as a guy who can play safety & CB. …as you can see in the Tweets, Covington and Sellers have confirmed they plan on visiting OU in February for the second junior day on the 23rd. Ringo said he is trying to confirm his plans and hopes to be heading out to Norman with his teammates for the weekend. Super K will have much more on all the recruits he was able to see while out in Arizona over the next week. *** Spoke to a source close to 2019 Offensive lineman Danielson Ike (Kansas City, MO. Rockhurst). Source let me know that Ike will be visiting Kansas State this weekend. While the visit is something of note, after speaking with the source, we still feel very good on where things stand with the Sooners and Ike. As you know, the Sooners are in the market for immediate additions to the offensive line after losing nine offensive linemen this cycle. With that in mind, the Sooners have been checking into a handful of Grad Transfer targets. We have told you about RJ Proctor and Tommy Kennedy and some of you have mentioned the name of Jonah Jackson (Rutgers). I was able to get in touch with Jackson and he let me know that he will be officially visiting the Sooners on February 15th. Jackson is a well-rounded offensive lineman who can play any OL position. In 2018 he started 11 games at right guard and was named honorable mention All-Big Ten by the coaches and media. He was also named to the Academic All-Big Ten list and was voted a team captain. I will have more on Jackson in the near future but just wanted to get that out to you. By now, if you have been reading our site, you are very aware of Pierce and know of his electric speed. 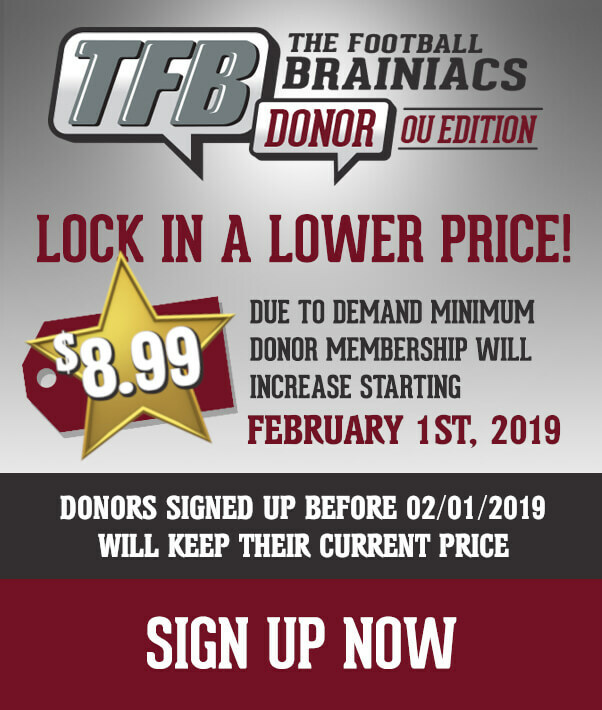 Of late, Pierce had let us know that OU and he were kind of at a standstill at this point due to the fact that while he had put in his request for his transcripts and paid for them, there was a long time period before the Sooners received them. With the offer made, I would assume the Sooners got the transcripts and are confident he will qualify. When exactly he would make it to Norman should he choose the Sooners, we are not quite sure but we have been under the impression it would not be until June at the earliest.